Christmas is just around the corner and Google Play Store is offering yet another deal to celebrate the festival. 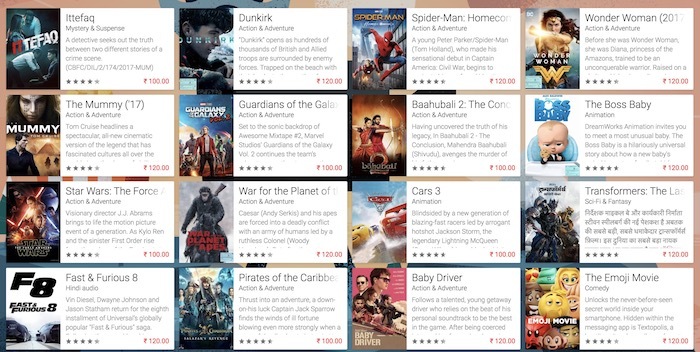 Starting today, Google Play Movies customers in India will be able to rent movies for just Rs. 20. Yes, you read that right. For just Rs. 20, you will able to rent any movie present on the Play Store. What’s make this deal even sweeter is the fact that Google Play Movies has a great selection of movies consisting of both Indian and international movies. Okay, now that you are up to date on the terms and conditions, you can go and rent a movie for yourself. It’s a bit sad that a user can only rent one movie, but hey, something is better than nothing, right? Do keep in mind the offer end date and the timeframe within which you need to watch the movie once you rent it. You don’t want to pay for a movie and then not be able to watch it because you missed the timeline. All that said, I know which movie I am renting, it’s Dunkirk by the way. Do share with us your selection in the comments section below.